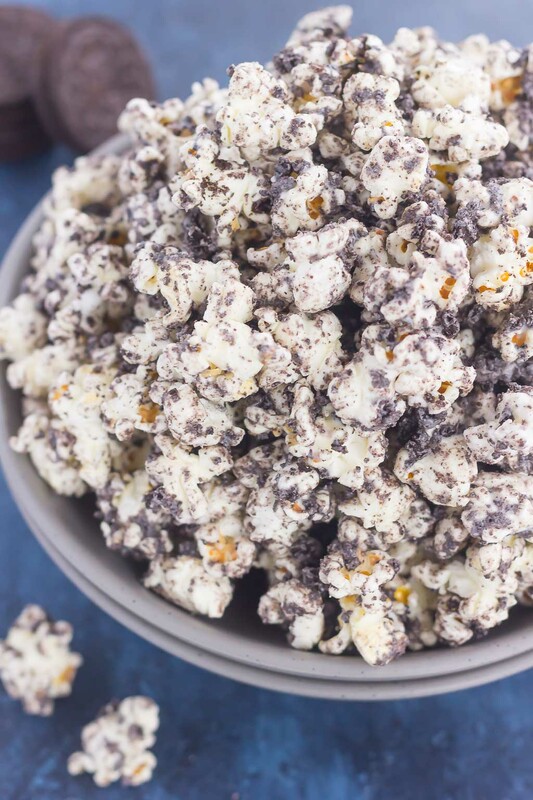 This Cookies and Cream Popcorn is an easy sweet treat that’s ready in less than 10 minutes. 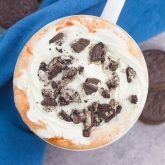 Popcorn is coated with creamy white chocolate and then sprinkled with crushed Oreo cookies. Fast, easy, and perfect to munch on, this is the ultimate treat for when those snack attacks strike! And now comes this Cookies and Cream Popcorn. Are we sensing a theme here? Cookies and cream anything steals my heart, so it was time I put some of my creativity to use. Not that this is the most creative recipe. You’ve probably seen versions of this kind of popcorn floating around in Pinterest land, but I couldn’t wait to put my spin on it and make it for the hubster and I. Because, after all, POPCORN! It’s one of those fun and tasty snacks that I just can’t seem to stay away from if I’m around it. And I’m no stranger to making my own popcorn. 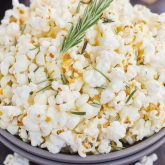 From this Rosemary Garlic Popcorn, to that Peanut Butter Candy Popcorn, this Salted Caramel Peanut Butter Popcorn and these Caramel Popcorn Balls, I love it all. I love savory versions, and I love the sweet kind, but what’s best is when it’s both salty and sweet. But, I guess most popcorn recipes are like that, right? Probably just another reason why I love popcorn so much! 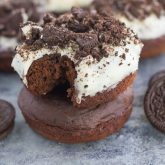 And cookies and cream, because Oreos are the best cookie for adding to desserts, at least in my opinion. But let me back up a minute. If you’ve been following my on my Insta-stories through Instagram, then you know that I’m a sucker for new Oreo cookie flavors. I always try the latest flavor and try to share them with you. From fruity pebble oreos, to hot spicy cinnamon and red velvet, I’ve tried and loved most flavors. What’s funny is that I never buy regular Oreos unless I’m baking with them. It’s just not a cookie that I grab to snack on, unless it’s one of the new flavors that I’ve picked up. But, add cookies and cream anything to a cake, cupcake, or ice cream, and I’m there. And if you’re like me, the munchies always come when the afternoon hits. It’s been so nice (yet kind of addicting) to have this Cookies and Cream Popcorn around. I try to limit myself to a handful (or three) a day, but it’s so hard to resist that chocolate cookie combo! Like most of my recipes, this Cookies and Cream Popcorn was ready in a flash. To save yourself even more time, you can use pre-popped popcorn. 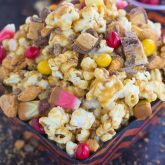 Simply drizzle some melted white chocolate over the popped popcorn and stir to combine. Add some crushed Oreo cookies and a dash of salt, and spread the popcorn onto two baking pans lined with parchment paper to set. And that’s it! Once the chocolate has hardened, you can break up the clumps and seal in an airtight container. To save time, I like to use already popped popcorn that you can buy in a bag (Skinny Pop is my go-to brand). 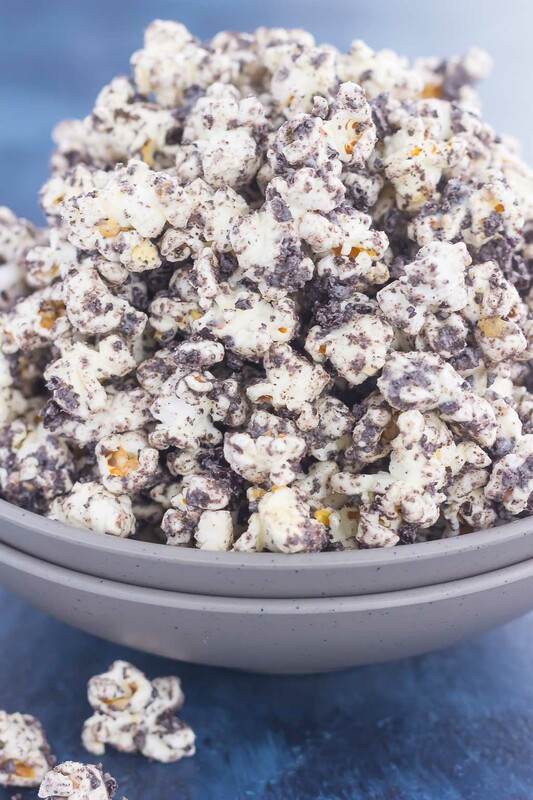 So grab those ingredients and whip up this deliciously easy Cookies and Cream Popcorn! It makes the perfect snack for both the kiddos and adults! 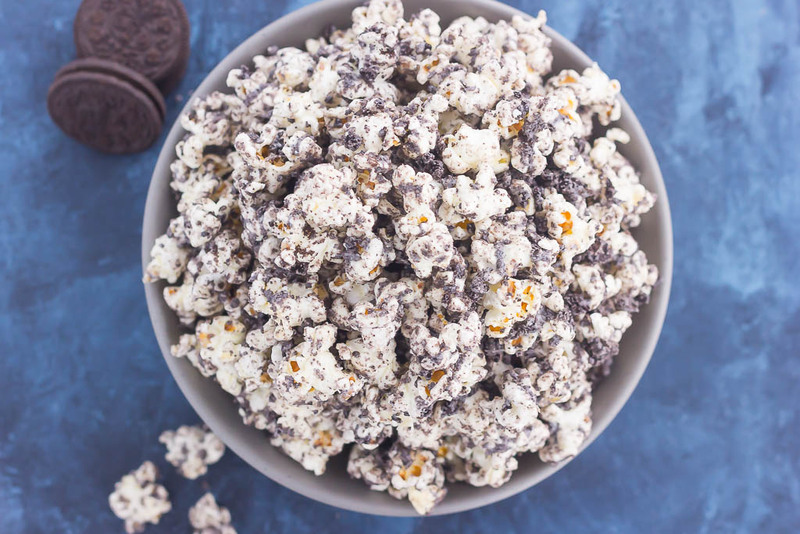 This Cookies and Cream Popcorn is an easy sweet treat that's ready in less than 10 minutes. 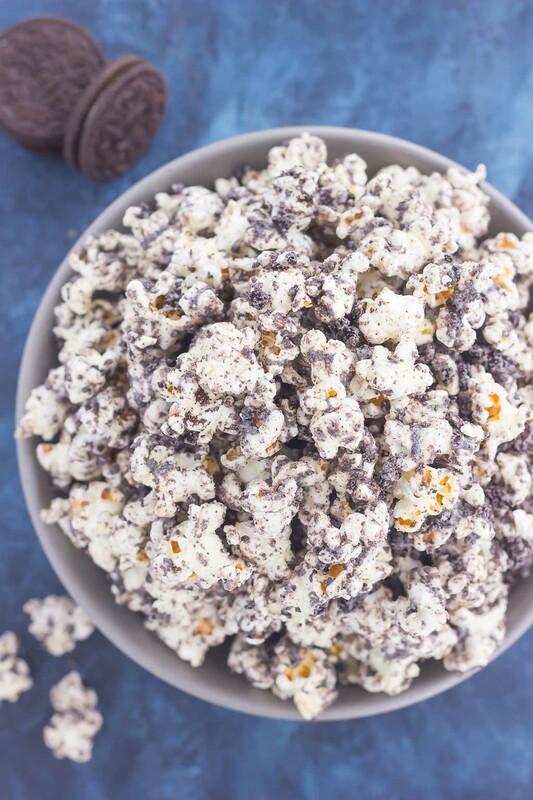 Popcorn is coated with creamy white chocolate and then sprinkled with crushed Oreo cookies. Fast, easy, and perfect to munch on, this is the ultimate treat for when those snack attacks strike! Add popcorn to a large bowl and set aside. In a medium bowl, melt white chocolate wafers/chips on medium power in microwave, stirring every 15 seconds so it doesn't burn, until smooth. Pour melted white chocolate over popcorn and lightly toss to ensure that the popcorn is completely covered. Spread popcorn onto two large baking pans or flat surface lined with parchment paper. Sprinkle crushed Oreo cookies over popcorn. Let stand for 10-20 minutes or until chocolate is set. Break info clumps and store in an airtight container for up to one week. I love cookies 'n cream flavors but never buy Oreos unless I'm making something with them either. haha And I love popcorn too! This recipe would be so dangerous around me -- I don't think I'd be able to stop eating it! Same with me! This popcorn really is addicting. Thanks, Marcie! how fun! bet it was delicious! Oh gosh, this definitely looks like the type of popcorn I would have ZERO self-control around!! Who could ever say no to cookies 'n' cream hanging out in your popcorn?? Yes! So addicting! Thanks, Sarah! I'm not sure, you'll have to look online or check your local grocery store.